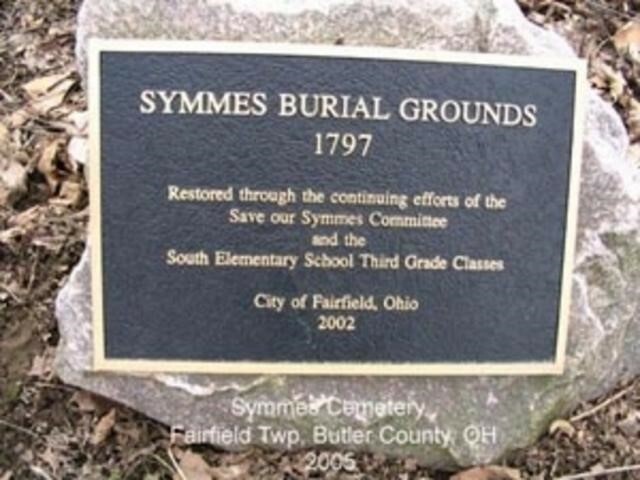 ﻿ Symmes Burial Grounds - Ohio. Find It Here. Symmes Burial Grounds is considered a historical site by the City of Fairfield. Once more than two acres in size, the site is believed to be the site of more than 125 graves, including the burial sites of of the Celadon and Phebe Symmes, the founders of Fairfield, and seven of their children. In May of 1974, the "Fairfield Echo" published a story about the restoration of the Symmes Burial Grounds. In the newspaper article, what was then called Symmes Cemetery was termed "the city's most historical site." According to the article, the cemetery was fenced and cared for under the direction of the Fairfield Township trustees until the area officially became the City of Fairfield in 1955. After that time, the site location then became "lost" except to a few persons and several Symmes descendents, the article explained.